Registration will allow you to post comments on newcanaannewsonline.com and create a newcanaannewsonline.com Subscriber Portal account for you to manage subscriptions and email preferences. 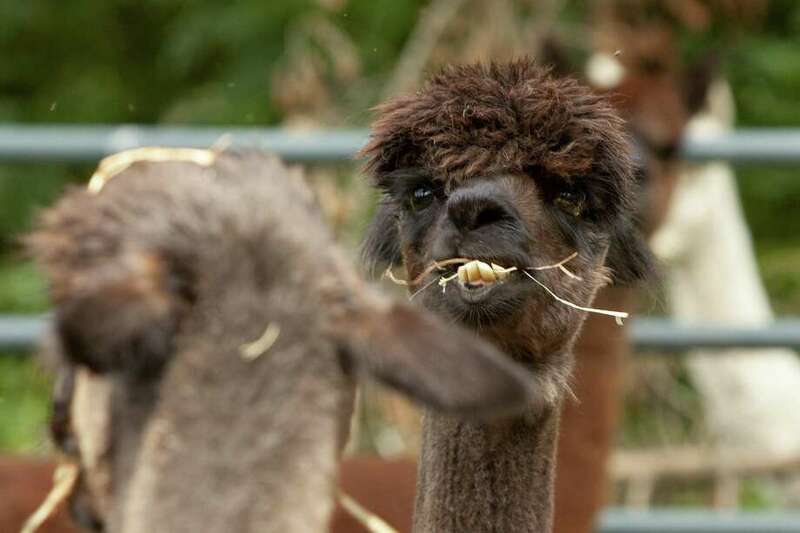 Bella Alpacas Farm/Sanctuary in New Milford, run by Salvatore Apicella, cares for rescued alpacas and other animals. The sanctuary harvests alpaca wool, sends it to spun and used in the creation of socks, hats and other clothing items. 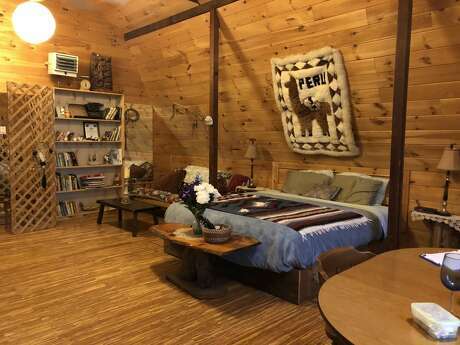 The Alpaca Farm/Sanctuary also rents rooms for guests to stay overnight. It was on one of the gloomy August days, of which we had so many this year, that I visited Bella Alpacas Farm Sanctuary in New Milford. The animals were a bit depressed (as was I) by the weather, so they were in hiding. “I thought there would be more alpacas,” was my first thought when owner Sal Apicella brought me over to an outdoor pen with a few male alpacas, a pot-belly pig, two chickens and a sheep that had been adopted by the alpacas as a friend. On nicer days, the animals roam around everywhere, Apicella told me, gesturing to expansive fields behind him. But then he brought me to the female area and decided to lure them out with some ground corn. Suddenly, like a clown car, more than a dozen lady alpacas came sauntering out of their barn, fighting for feed and examining their new guest. Unafraid, they looked right at me, seeming to smile with their bottom buck teeth jutting out. The male and female alpacas are kept in separate areas to keep them from breeding all year round; alpacas do not have a mating season. They do breed the alpacas once in a while for the “beauty of having a baby around.” In all, Apicella and his wife, Judy, have 28 alpacas on their farm. Bella Alpacas has an unassuming entrance off a residential road. On the property is Apicella’s home that he shares with his wife and teenaged son Nico, a few houses he rents out to tenants and a loft above the male alpaca pen that is available to rent for weekend getaways. Apicella, dressed in sweat pants and rubber boots, walked me through the natural, unmanicured property and explained in his Italian accent how it came to be. Apicella grew up in Italy and spent much of his time as a boy on his grandparents’ vineyard surrounded by farm animals. In 1999 he moved to New York City to help his father run his restaurant and to study English at Columbia University. He planned on going back to Italy eventually, but then he met Judy. They got married, had a son and made a home in the Hell’s Kitchen neighborhood of Manhattan. But it was not right the life for them. The Apicellas bought the farm in 2006 and meant for it to be a weekend home. Eventually, they decided to have some animals and rescued two pigs, two alpacas and two sheep. “We were somewhat city folks. We knew a little bit, but it was a big learning process,” Apicella said. The couple started learning about all the area’s alpacas in need of homes as farm owners found themselves not being able to put in the work to care for them. The Apicellas rescue the alpacas and either keep them on their farm or find other safe homes. Apicella estimates they have rescued about 200 alpacas so far. Alpacas, Apicella said, are very sweet, docile animals. They make friends for life (as the males have with the sheep) and they don’t have many defenses against predators. Apicella only lets guests spend alone time with them once he feels comfortable with the people. He and Judy are very protective and doting over their herd, feeding them only organic feed and filtered water, and treating them mostly with Chinese herbs and acupuncture. All of the Apicellas’ animals are kept as pets. Judy comes down into the farm every morning to rub the pot belly pig’s pot belly. Once she was under the weather and missed a morning, so the pig went to the house and knocked on the front door looking for her. None of the animals are used for meat. “Our chickens die of old age,” Apicella said. They do, however, sheer the alpacas and make products from their wool, including their most popular item: socks. Alpaca wool is 100 percent hypoallergenic and is suitable for “three season” socks — worn throughout fall, winter and spring. He travels to Westport, Fairfield and Litchfield selling alpaca goods and Judy’s herbal creams and lotions at farmers markets. They turned the farm into a bed and breakfast in 2008, allowing guests to stay on the property, enjoy the animals and take yoga classes from Judy, a certified yoga instructor and herbologist who teaches at Kent Prep. It was actually too successful. Apicella said they got so busy with the bed and breakfast, that it was taking away from the peaceful and relaxed lifestyle they wanted. About two years ago, they cut back and decided to offer one loft for weekend getaways at $215 per night. Their success has not diminished; Apicella said they are typically booked four months in advance. They also do Sunday tours for $25. The loft where guests stay isn’t much to see from the outside; it’s a plain shingled structure decorated with TripAdvisor accolades. Like the rest of the farm, it’s no-frills, authentic farm living. The interior, however, is a clean wooden loft with a peaked ceiling and chic country decor, including a large knit alpaca tapestry above the bed. There’s a bookshelf, a dining table, a couch and a porch overlooking the farm. What guests won’t find there is cable or Internet (though they do have DVDs). “We do not have cable or WiFi, and we’re very proud of that. We have realized since 2007, how many couples have come out and thanked us for having no distractions. They actually talked to each other and read a book,” Apicella said. Most of the guests that stay at Bella Alpacas are city people from New York or Boston looking for an escape to nature. Guests explore the New Milford area and go hiking and kayaking or check out the vineyards and the Elephant’s Trunk Flea Market down the road, but for the most part it’s about interacting with the animals. Towards the end of our tour, I noticed a white alpaca staring out at me through the inside of a glass door, so I asked to go see him. Apicella walked me over to a third pen where a few of the Apicellas’ special needs alpacas stay. These are animals who have small deformities or ailments, so they are kept together and play in a smaller, closed off area instead of running out in the large fields with the others. As I was heading out, the sun started peeking through the clouds for the first time in days and I left in good spirits knowing the alpacas, like me, would spend the rest of the day basking in the warmth. Lidia Ryan is a freelance writer.